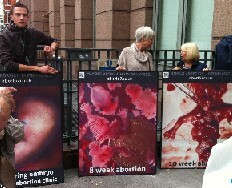 Earlier this week, the anti-choice campaign group Abort 67 staged a protest at Sussex University. You’ve probably heard of this particular bunch of anti-choicers before – they’re somewhat infamous for their bullying tactics and can often be found harassing people who try to enter clinics, armed with hugely misleading anti-choice propaganda and graphic images of aborted foetuses. They have also been known to film members of the public. All these tactics have one thing in common – they are deliberately designed to distress those subjected to them. It’s bad enough that such a group exists in the world, but it gets worse. Whilst Abort 67 was at Sussex University, one student who spoke to them learned that they are planning to target more universities in the future. Listed by name were Nottingham, Cambridge, Manchester, Liverpool and Bristol, with Nottingham being the next. Yep, that’s right. They’re planning an anti-choice university tour. So now the group has suddenly set their sights on harassing students, it’s interesting to ask why. When Abort 67 protests outside clinics, their vile logic is clear – they’re hoping to intimidate people at their most vulnerable. But when they appear on university campuses I think they do so with a completely different mindset. Like my university (UCL), some of those named by Abort 67 have official pro-choice policy in place within their student unions. And we only make up a small part of a nation-wide pro-choice student movement. This explains why any university may now be in for a visit from Abort 67 – unlike the people they target outside clinics they do not see us as ‘vulnerable’, but rather as powerful. If the whole situation were not so sickening it would almost be flattering. We’ve put up enough of a fight thus far for them to want to try and beat us back down. – Pass a motion within your Union noting the protest in Sussex and condemning Abort 67’s bullying tactics. This motion could involve calling upon your student union to help publicise or fund a retaliation should the group arrive. For help with this, try getting in contact with your Union’s Women’s Officer or Welfare Officer. – If the group do arrive on your campus then stage a counter protest. Use banners, noise and be creative! Sussex students also had the good idea of covering up the images Abort 67 use. – Help publicise counter-protests and support the universities around you. – Spread the word that universities are likely to be targeted. It’s particularly important that we get the message to students at the universities listed by Abort 67. Attacks on the right to choose – from the government, from the media and from anti-abortion protest groups – are coming thick and fast. Abort 67 has actually given us an important reminder, if one were needed, that students need to be at the forefront of the fight for reproductive rights. Annie goes by @hurrumble on Twitter.